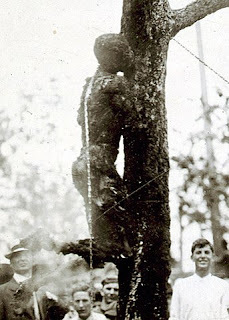 The photo is of the lynching of Jesse Washington in Waco, Texas, on May 15, 1916. He was repeatedly lowered and raised onto a fire for about two hours. A professional photographer took pictures of the lynching as it unfolded. There have been lynchings within living memory, in the '80s. If this were wholly past history, there wouldn't be over 70 active KKK organizations in the United States today. This month (March 2018) in our small southern town a dozen people, blacks and whites, gathered under a hanging tree. The noose dangled in the breeze. A black high school student read powerful blank verse about her daily experience with racism. An elderly black leader in the community climbed painfully onto a chair, and spoke briefly with the noose around his neck. "Lest we forget," he said, "what is burned into our history, our understanding of how our society still treats us, our 'place'." His goal was to make a safe space where the trauma of the black experience and its political and social implications could be named and discussed across color lines openly. Oh Lord, you've shown us the way, but it is so hard. Lord, you've shown what those of us with privilege should do. We ask for your courage. For Lord, you're the most privileged of all. You have eternal life. You have power. Yet you laid it all down. We were disappointed in life, and angry at its injustice, and you didn't force us to behave. You give us our freedom, our choice. You didn't call on your legions of angels to protect you, you refused to coerce us, you gave yourself into our power. And we hung you on a tree. Lord, you accept us even when we do you wrong. You sat down and ate with us, while we were yet sinners, offenders. You ate from the same bowl as us, traitors. And we crucified you for it. If we are to display your spirit, Lord, that's the risk we have to take with each other. We have reasons to fear each other. We have reasons to want to control each other. But your spirit, Lord, would have us give up all forms of control, physical control, social control, economic control, give up manipulation and coercion, give ourselves into the control of our enemy, like you did with Pilate—that's giving them freedom—and risk everything on their choice, on whether they respond with your spirit too? Oh God. This is a hard way for us, Lord. We ask for your courage. We get the message, we will try to treat each other the way you treated us. That is our goal, Lord, we often fall short. Forgive us, Lord, and help us be like you. Lord, there's another piece of this bloody story too. Some of us are hurting, Lord. We've been traumatized. We are in pain. This tree is what the system does to us. We've seen this kind of thing before, and we'll see it again. Are we supposed to climb up on that tree, is that all you've got to offer, Lord? We could use a little power, here. But you remind us that you wanted to heal your enemies, and part of that was confronting them and calling them to repentance. You wanted to ignite their spirits, not snuff them out. If we can really hope for that, Lord, it would be OK. We don't have to be on top. All we want is a just relationship. We want to muddle through life together, not on top, not on the damn bottom, as equals. We want to be able to confront them with what they've done and continue to do, and call them to repentance, while at the same time showing them that we will not coerce them. Help us to heal our enemies, Lord, while they are still oppressing us. We ask that we succeed in igniting your spirit in our enemies so that they change their ways and stop crucifying us. We ask that the cross, that tree, not be our lot. We ask that we succeed where you didn't, Lord, and so many of our brothers and sisters didn't. Our only hope is that your weakness is stronger than the power of men. Be with us, Lord. We are your hands and feet, be with us in our suffering. Give us the strength to fight power by igniting your spirit in our enemies. This is hard, Lord. We ask for your courage. We ask for your spirit to dwell in us. Several people expressed thanks for the prayer.